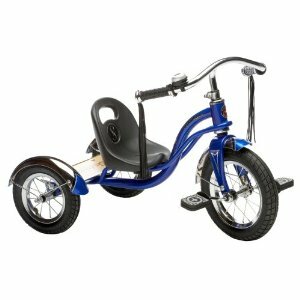 The Schwinn Roadster Tricycle falls into the retro category of trikes – heavy-duty metal construction and rubber tires – but adds also some modern design to the mix, mainly for increased safety. And this idea earned this bike a #1 best rated spot. Known disadvantage of many retro tricycles is their problem with stability – for example the Radio Flyer Classic has a seat quite high above the ground which can cause it to tip over when turning too quickly. Schwinn used a different kind of design here. The seat is bigger and much more closer to the ground which creates very low center of gravity and prevents tip-overs. Also the rear wheels are so wide from each other – a real cruiser. We must say this trike is really stable, even in higher speeds. Solidly built metal frame is used which makes the Roadster very sturdy and hard to damage – but creates a little disadvantage as well – it`s slightly heavier than other trikes. Your kid will love those many fancy things that are present – shiny silver fenders, chrome handlebars (with padded grips), long tassels and nice ringing bell. The seat is comfortable and adjustable as well and there is also a wooden back deck for added passenger. Smooth ride is provided by real rubber tires – front wheel has 12 inches in diameter, rear wheels 8. It is available in three color variations: red, blue or pink. There has been a debate what`s the right recommended age of the Schwinn Roadster (as there appeared a mistake on the covers). From hundreds of customer reviews we can say that the best age when to start with it is from 2 to 3 years. At 2 years most children won`t probably reach the pedals yet – but most customers say their kids love the trike anyway and use their feet to push themselves (the seat is really low so it`s not a problem) until they`re able to pedal. 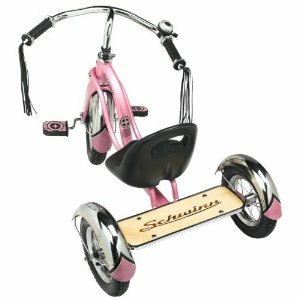 This entry was posted on Monday, May 16th, 2011 at 6:08 pm	and is filed under Kids, Schwinn.